The knowledge base will answer the most important questions you have about Paymo, giving you detailed information about each available feature. You can head directly to a section that interests you or use the search option if you’re looking for something specific. We’ve designed the knowledge base to be as “actionable” as possible. That’s why, when you search for an answer make sure your queries are something like: “How do I […]?”. Eg: How do I add a project? How do I delete a client? etc. On the bottom right you'll find a chat icon so you can contact us in case you didn’t find the answer you were looking for. Just let us know what your question is and we’ll get back to you in no time. 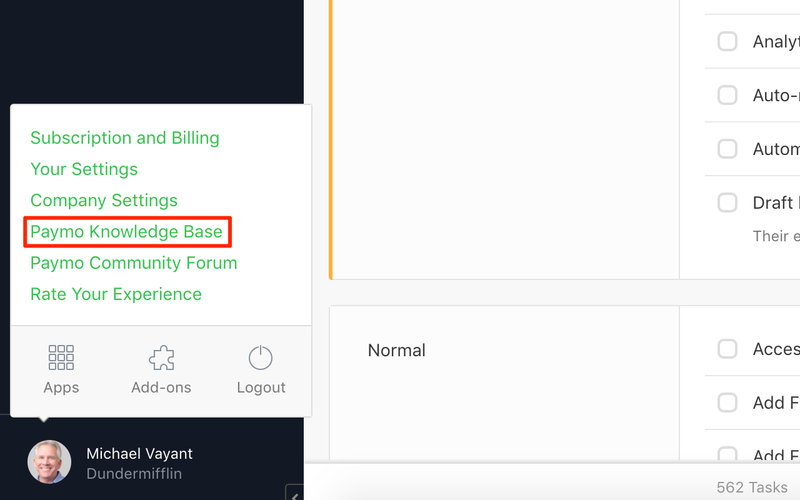 You can access the knowledge base from within the app by clicking on Your name (bottom left corner) → Paymo Knowledge Base. If you are logged into your account, when you click on the links that point to sections in the app, that section will open up in a new tab. This grants you quick access to it.